MD: You can’t get so-called crypto currencies right if you don’t know what money is. Money is obviously and provably “an in-process promise to complete a trade over time and space.” Money is always, and “only” created by traders making such promises. Money is destroyed as those traders deliver as promised. And if they fail to deliver as promised the resulting DEFAULT is immediately reclaimed by INTEREST collections from new money-creating traders with a like propensity to default. Knowing this, let’s parse this article and expose this writer’s delusions. Bitcoin suffers a big correction after swinging wildly in the last 10 days of December. … Sometime in the next three months we will see a sell-off as latecomers panic and sell. Long-term investors will remain in bitcoin and it will creep back up, but will not revisit its December highs. MD: Admission of failure. “Real” money doesn’t have big corrections and swings. 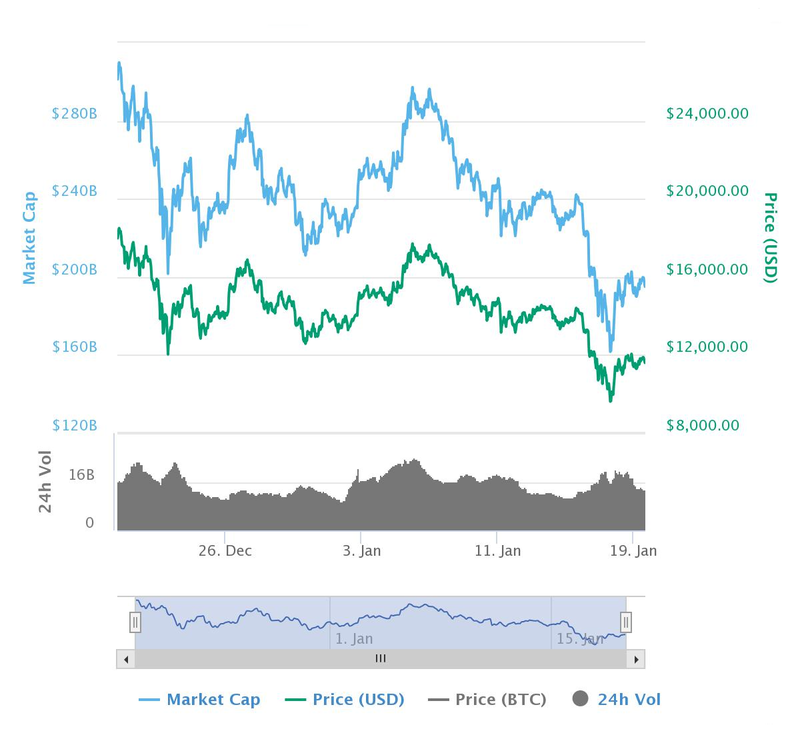 Bitcoin peaked about a month ago, on December 17, at a high of nearly $20,000. As I write, the cryptocurrency is under $11,000 … a loss of about 45%. That’s more than $150 billion in lost market cap. Here’s the thing: Unless you just lost your shirt on bitcoin, this doesn’t matter at all. And chances are, the “experts” you may see in the press aren’t telling you why. In fact, bitcoin’s crash is wonderful … because it means we can all just stop thinking about cryptocurrencies altogether. In a year or so, people won’t be talking about bitcoin in the line at the grocery store or on the bus, as they are now. Here’s why. Bitcoin is the product of justified frustration. Its designer explicitly said the cryptocurrency was a reaction to government abuse of fiat currencies like the dollar or euro. It was supposed to provide an independent, peer-to-peer payment system based on a virtual currency that couldn’t be debased, since there was a finite number of them. MD: Delusion admission: When you’re talking about “real” money, there is a perpetual perfect balance between supply and demand for the money itself. And of course both are finite and both vary in lock step. That dream has long since been jettisoned in favor of raw speculation. Ironically, most people care about bitcoin because it seems like an easy way to get more fiat currency! They don’t own it because they want to buy pizzas or gas with it. Besides being a terrible way to transact electronically — it’s agonizingly slow — bitcoin’s success as a speculative play has made it useless as a currency. Why would anyone spend it if it’s appreciating so fast? Who would accept one when it’s depreciating rapidly? MD: Bitcoin’s major flaw in this regard is its insistence on keeping track of every single trade (and thus fractioning) of the bitcoins once created. This is totally unnecessary. All you must keep track of is the creation of “real” money by traders and the destruction of it as they deliver. You must keep track of defaults and meet them immediately with like interest collections. Beyond that, the “real” money trades totally anonymously. Bitcoin is also a major source of pollution. It takes 351 kilowatt-hours of electricity just to process one transaction — which also releases 172 kilograms of carbon dioxide into the atmosphere. That’s enough to power one U.S. household for a year. The energy consumed by all bitcoin mining to date could power almost 4 million U.S. households for a year. MD: Tying the Bitcoin nonsense to the global warming nonsense is truly humorous. That not-withstanding, a “real” money process consumes virtually zero energy. The trees have to look elsewhere for their carbon dioxide. Paradoxically, bitcoin’s success as an old-fashioned speculative play — not its envisaged libertarian uses — has attracted government crackdown. We may see a functional, widely accepted cryptocurrency someday, but it won’t be bitcoin. MD: All will fail just as bitcoin will fail. Why? Because none of them behave as real money. Nothing can out-compete real money. At best, it can only tie. Good. Getting over bitcoin allows us to see where the real value of cryptoassets lies. Here’s how. To use the New York subway system, you need tokens. You can’t use them to buy anything else … although you could sell them to someone who wanted to use the subway more than you. MD: Subway tokens are close to “real” money. They are created by those intending to travel. They are destroyed as they complete their trip. In the process, there is perfect balance between supply and demand for them. They fail as real money because they can only be used in one very narrow marketplace … the subway. That, in a nutshell, is the scenario for the most promising “cryptocurrencies” other than bitcoin. They’re not money, they’re tokens — “crypto-tokens,” if you will. They aren’t used as general currency. They are only good within the platform for which they were designed. MD: With real money, there is no distinction between tokens, coins, currency, or ledger entries. The money can move from one form to the other with perfect freedom. Just like a baton plays no role in running a race, the tokens themselves play no role in actual trading. They are simply a score keeping mechanism. MD: Nonsense. The proper unit of measure of real money would be the HUL (Hour of Unskilled Labor). It never changes its value over time and space. It always trades for the same size hole in the ground. So does real money. That will make them real assets, with intrinsic value — because they can be used to obtain something that people value. That means you can reliably expect a stream of revenue or services from owning such crypto-tokens. Critically, you can measure that stream of future returns against the price of the crypto-token, just as we do when we calculate the price/earnings ratio (P/E) of a stock. MD: Tokens and currency are real assets with “recorded” value, not intrinsic value. If I have currency and I exchange it for a ledger entry, that currency (which has never had intrinsic value but does have trading value) can be burned and there is no change in value anywhere. Money in the form of currency or tokens is only money when it is involved in trade. And if someone puts them under a mattress, it “is” involved in trade. However, if the process exchanges it for a ledger entry and the currency or token is placed on a pallet, in that store it has zero value … just like a baton sitting in a locker before or after a race plays no role in a race. Bitcoin, by contrast, has no intrinsic value. It only has a price — the price set by supply and demand. It can’t produce future streams of revenue, and you can’t measure anything like a P/E ratio for it. MD: This is a major major delusion. Money has a unit of measure (ideally the HUL – Hour of Unskilled Labor) but no price. This is because the supply/demand ratio is guaranteed to be perpetually unity. One day it will be worthless because it doesn’t get you anything real. MD: Real money will always have value as long as “responsible” traders exist. Responsible traders don’t default. They use money as it should be used … as an in-process promise to complete a trade over time and space. And the vast majority of us are responsible traders. There are really very few deadbeats and the proper money process quickly makes them uncompetitive traders and they are naturally ostracized from the marketplace. The crypto-token ether sure seems like a currency. It’s traded on cryptocurrency exchanges under the code ETH. Its symbol is the Greek uppercase Xi character (Ξ). It’s mined in a similar (but less energy-intensive) process to bitcoin. MD: Oh really? What is the distinction? What is the difference? MD: With real money a process is needed to keep track of things. But that cost is negligible compared to the cost of the things being tracked. Ether tokens get you access to one of the world’s most sophisticated distributed computational networks. It’s so promising that big companies are falling all over each other to develop practical, real-world uses for it. Because most people who trade it don’t really understand or care about its true purpose, the price of ether has bubbled and frothed like bitcoin in recent weeks. MD: This isn’t because of misunderstanding. It’s because there is not guaranteed perpetual balance between supply and demand for the stuff. But eventually, ether will revert to a stable price based on the demand for the computational services it can “buy” for people. That price will represent real value that can be priced into the future. There’ll be a futures market for it, and exchange-traded funds (ETFs), because everyone will have a way to assess its underlying value over time. Just as we do with stocks. MD: Does this suggest it somehow maintains perfect supply/demand balance for the money itself? How does it do that??? MD: Proving you are deluded. If you knew what money was and you knew what you speak of to be money, you know perpetually what its value will “always” be. MD: This reminds me of the quip “you have to love standards … there are so many to choose from”. Previous PostPrevious Can Central Banks Keep Control of Interest Rates?